#6 CHARLES MY BOY finally managed to get his first win last time out, following numerous near misses. He is taken to double the score here. #4 Royal Resolution settled for 4th in his follow up, after an eye-catching debut in the 16th meeting. He will appreciate the Draper’s Mile and a competitive showing is forthcoming from him. 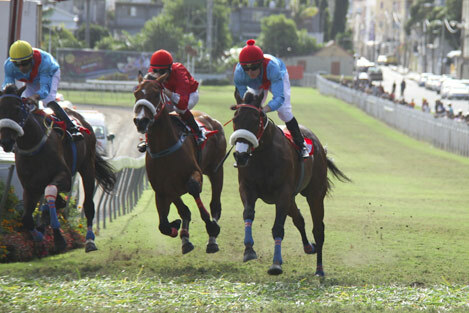 #3 Man From Seattle failed to confirm in his latest, although he was not very far away behind the winner – Volatile Energy. He can bounce back in this contest. #5 Spin A Coin is reunited with Dinesh Sooful and is worthy of consideration, while #7 Bear Hug and #2 Gstaad are good contenders for the lower placings. With the presence of #5 Raheeb and #7 Final Cup in this 1365 metre contest, events of the 16th meeting come into mind. Both went into battle in the final straight that day, with the first-named horse coming out on top. Both are in good nick and are rated as good chances. However, our vote goes to Debutant #3 POWER OF PEACE. A son of Dynasty, he has shown up very well in his exercises, even giving a certain Ready To Attack a run for his money. With Daniel Stackhouse on board, he can run a cracker. #6 Saracen King had to settle for second best behind Sierra Redwood on Derby day. Don’t rule him out from going one better here. #8 Philosopher is down a Benchmark and should run on improvement, while #2 AL Dangeur is back from a long rest and is rated as a decent outsider. #1 Arctic Flyer may have proved difficult to ride in his latest, but it did not stop him from winning. Freshened up, he has a good chance of doubling the score. #6 GAMELOFT has not confirmed his win in his seasonal debut. He looks to have regained his optimal form and with Tristan Godden riding in confidence, he can run a cracker here. #9 Rock On Geordies had no answer to the winner in his previous attempt. He always performs consistently though and is entitled to have a big say in this. #3 Hithimagainchuck is a promising sort and has shown potential in his gallops. He is not prevented from making it at the first time of asking. #7 Ocean Drive South returns after a long absence. Down a category compared to his last start, he should be thereabouts. #7 IN YOUR DREAMS made the headlines in the Golden Trophy meeting, not only striking for the first time in 2018, but also setting a new track record over the 990 metres. This Amar Sewdyal-trained gelding remains in top order and even if he is up two categories, he can still confirm. #2 Wavebreaker has performed genuinely this season and in this contest, he is rated as the biggest threat to the selection. #1 Streetbouncer was the best of the rest behind the irresistible Argo Solo in his last attempt. He is down a Benchmark and is entitled to be in the shake up. #5 Bono makes his debut for Simon Jones here. He has worked well and he won’t be that far away. #3 Rinjani also makes his debut in this contest. He would have preferred a longer trip, but he is not prevented from making the frame in this. #1 ACT OF LOYALTY comes into this race on the back of two wins. Still in excellent shape, he can seal his hat-trick here. #7 The Right Road has rediscovered his South African form based on his recent races. He merits tons of respect in this. #3 Aware opened Tristan Godden’s account just two meetings ago. He remains well and is capable of confirming. #5 Bonnie Prince’ last start must be ignored as he had difficulty throughout the run. It would be wrong to put a line through his chances here. #4 Belenos was a major disappointment in his last showing. He has benefited from a break and having worked well, he can be right in the mix. It is very hard to choose a favourite in this Group 1 contest, with many competitors capable of taking glory. #1 TABLE BAY is one of them and he has his eyes firmly set on a third consecutive Group 1 win. In excellent form, he is also capable of ending his yard’s long winless spell in this race. #3 Baritone has been well-prepared for this contest. If he is able to follow within striking range, he will be very hard to stop in the closing stages. #6 Yankee Captain and #2 Karraar represents Gilbert Rousset’s yard, whose record in this race is quite formidable. Both won brilliantly in their last races respectively, and it is conceivable that either can confirm here, especially with the former having landed the pole position draw. #5 Nottinghamshire may have been second best in the Hinterland Cup, but it was enough to seal the Sprinters’ Championship. He is capable of renewing with success in this. Stable mate #4 Hard Day’s Night has been chosen by Juan Paul van derMerwe. Having benefited from a break, he looked in good nick in training and he can justify his jockey’s decision to ride him. #8 Tandragee, a three-time place getter in this race, runs very well fresh and is worth a thought in this, even if he has been drawn widest of all. #1 JALS TIGER was surprised late on by In The Loop in the 20th meeting, missing out on the chance of completing his hat-trick. Nevertheless, he is taken to renew with success in this. #4 Burwaaz had a terrible getaway in his recent attempt, and he had to come from behind to land the final podium spot. If he gets it right this time round, he will be hard to stop. #3 Sacred Flame showed bags of progress just two meetings ago. A reproduction of that run can see him do even better here. #9 Shreya’s Star produced his best showing of the season in the 16th meeting. He is not prevented from making his presence felt. #2 Doyles and #6 Roventas are two good place bets. Not a lot to choose from in the final contest of this Group 1 meeting and perhaps the pick lies with #5 SIR CAPERS, who is new to Patrick Merven’s yard. He has shown up very well in his trials and can run a cracker at the first time of asking. #6 Varside has not been seen since the end of May, when he finished runner-up to Storm Clipper. He runs well fresh and as he hails from an in-form yard, he can make it here. #2 British Pound is in better shape and form after his debut. Improvement is forthcoming from him. #10 The Judicator was sent home for an early shower, after losing his marbles in the starting stalls in the 16th meeting. He has been an ever present at track work since and in this ordinary field, he should be in contention. #4 Gondwana was last seen finishing runner-up to Ready For Take Off in the 9th meeting. He has been working extensively though and he can make his presence felt.